I ordered a new 13 inch MacBook Air from Apple.com on Black Friday. Apple.com was dangling a 10% discount on select items. The 13 inch MacBook Air was one of them. 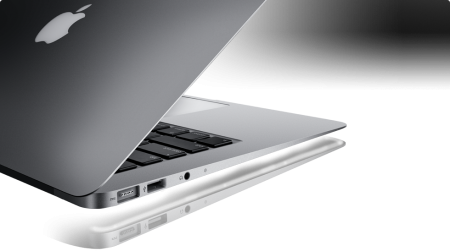 I’ve decided long ago that I’ll go for a MacBook Air. I just didn’t know which model to choose. When the opportunity came along on Black Friday, I went for it. The 10% savings was equivalent to about $101, a bit less than the amount that I’ll pay for the California sales tax. With that discount, I went ahead and doubled the RAM memory from 2GB to 4GB. The upgrade was well worth it. I’m excited. I can’t wait any longer for this laptop to show up on my door. Apple gave me a FedEx tracking number. It’s interesting to watch this product shipped, from its origin of Shanghai, China, to Anchorage, Alaska. Soon enough it will be in the Bay Area and to my doorstep. I can’t wait. I said that already. If you own several WordPress blogs and you want to manage your blogs from your smartphone, there are several WordPress applications that are available for the iPhone, Android, Blackberry and Nokia. WordPress for the iOS is an iPhone application that will let you manage your blog from your iPhone and the iPad. You can create or edit posts and pages, and add images, videos, and comments to your blog with ease. Download the WordPress for iOS from Apple’s website for free. You can also visit the WordPress for iOS blog. WordPress for Android is an Android application that’s available in the Android Market. Just search for WordPress and install the application that’s published by Automattic. You also might want to visit the WordPress for Android blog. Here’s a preview of WordPress for Android app in the video below. See how easy it is to manage blogs from the Android. WordPress for Blackberry is an application that allows you to write posts, upload photos and videos, edit pages, and manage comments in the Blackberry phone. The application will run on BlackBerry devices starting with the 8700, Curve, Pearl, Bold, Storm, Storm2 and the Tour. BlackBerry Device Software (OS) Version 4.5 minimum is required. Visit the WordPress for Blackberry blog. WordPress for Nokia is an application that allows to edit your existing blog content, add new posts and pages, or simply manage comments from your Nokia smartphone. WordPress for Nokia allows you manage your blog from your S60 or Maemo-powered Nokia phone. Visit the WordPress for Nokia blog. Download the application. Older phones may not be supported. The next Ubuntu release, version 11.04, code name Natty Narwhal, will be so drastically different than any Ubuntu release, that you may not recognize it at first glance. The changes are going to be so dramatic. First of all, the Gnome Shell we are all accustomed to seeing, will be replaced by the Unity interface, which is already the standard in Ubuntu Netbook releases. Here’s a sneak peek of the Unity interface. The Unity interface’s main strength is having easy access to applications. The familiar Gnome pull down menu taskbar at top of the screen will go away, to be replaced with Unity’s icons on the left side of the screen. The Unity interface comes with social media in mind. Unity users will be able to access Twitter and Facebook straight from their desktop. In terms of office suite, LibreOffice will replace Open Office as announced earlier by Canonical, the company behind the Ubuntu releases. In addition, Firefox 4 will be the default browser, along with Banshee, which will replace the Rythmbox Music Player. 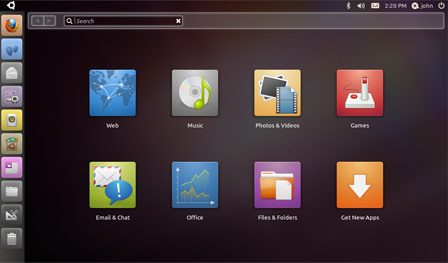 Finally, here’s a sneak video of Ubuntu running the Unity interface.